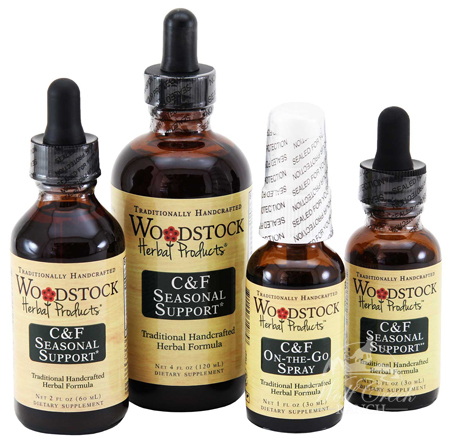 Woodstock Herbal Products C & F SEASONAL SUPPORT Many of our customers, including ourselves, lost one of our favorite "go-to" products, when Quantum Herbal Products went out of business; Quantum Herbal's Cold & Flu Formula was one of our most popular products. There has been no product to fill that void until now...we have been blessed to have Woodstock Herbal Products and their organic herbal C & F Seasonal Support. Available in 1 oz., 2 oz., 4 oz. or 1 oz. On-The-Go-Spray. C & F SEASONAL SUPPORT ~ is a highly effective organic cold & flu remedy, using the same formula as Quantum Herbal Product's Cold & Flu Formula.